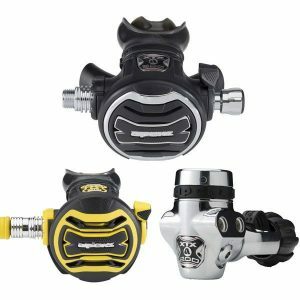 Scuba regulator servicing is one of the most important maintenance tasks for your scuba diving equipment. Generally unless you have had specialist training, you cannot do it yourself but you can ensure that day-to-day maintenance tasks, such as thorough washing of your regs in fresh water, is completed at the end of your day’s diving. Protecting your second stages from being trodden on or dragged across the rocks is also a good idea but one that is often overlooked post dive. Another thing you should do is use your back up air supplies regularly to make sure they actually work. If you dive with a pony bottle and regulator for example, make sure you take a few breaths from it reasonably often, just so you know it’s all working fine. A broken back-up isn’t something you want to discover when you really need it. Well most manufacturer’s advice is annually and although it may be tempting to ignore this advice you need to be sure you aren’t invalidating a manufacturer’s warranty by not following their servicing schedule requirements. The other key thing is of course that this is actually a piece of life support equipment so it’s a critical item that has to work not one that’s just inconvenient if it doesn’t. If you haven’t dived for a while, then it is very important they are tested not just for safety but also to avoid lost dives from finding out there’s a leak or similar issue when you’ve arrived for your dive trip and are out of reach of a service centre. Simply having them stored in your garage as most of us do, doesn’t ensure they will work because they did when you put them away. So although regulator servicing is often seen as an unnecessary expense by some divers, it really needs to become part of your annual routine. What happens during a regulator service? The service itself involves more than a simple functionality check and a clean. The regulator will be stripped down, cleaned, worn parts identified and replaced, O rings and other “service kit” items will be replaced and then the unit will be full re-assembled, reset under operating pressures and tested. We know from the many thousands of services we have carried out, that units can function even though there are broken or damaged parts inside. This makes them more prone to failure during a dive. As divers we all make our own choices as to how we manage our kit, but when dealing with your regulators in particular, we would strongly recommend following the manufacturer’s servicing instructions and keeping them fully serviced.